We hope that you all had a good bank holiday weekend. Whether you were racing or taking it easy, we hope you are ready to get stuck back into the routine of training. Club Events: The club would appeal to its members to make a special effort to attend club events. These events are highlighted in the top post on this website. We are starting a roll over session on Thursday and the first official lake swim on Sunday. Try to make it if you can. Lake Swimming: The lake is starting to warm-up nicely in advance of our first official dip of the year on May 12th at 6:00pm in Youghal. Try and buy a wetsuit asap. For those of you that have not swam open water before you should try and practice out in Dromineer beforehand from pier to pier, as you can stand up at all times. Don’t presume that you will be fine! Run Racing: The Great Limerick Run took place on Sunday and the club had 6 representatives in the half marathon – Johnny Meagher, Eddie Tucker, Benny Delaney, Mary Donnellan, Mary Cahalan & Majella Moyles. Luckily, none of them disgraced the club!! North Tipperary VEC awards 2013: Killian Cullagh won an individual sports award last week. I think it was for greco-roman wrestling. Well done Killian! Saturday Cycle: A dozen cyclists left the pool and the route headed for Latteragh and Seanin’s Hill. A stop was called at the start of the hill and people were unsure of the purpose. Was it to take on advise from Dan on the best way to get up while keeping your heart rate down, or would there be a little prayer group looking for divine help? It actually proved to be a very early “comfort stop” for some of the lads. The hill wasn’t so bad in the wind up, with everyone going at their own pace. There was agreement at the top to alter the planned route slightly (sorry Majella). Instead of Dunkerrin the route went Moneygall and then Cloughjordan. Roll over went well with fairly constant change at the front and this helped to keep the group together. Mileage was added out the Portumna road and then on to Terryglass. The rolling route to Coolbawn was tough but enjoyable as the day got brighter. At Coolbawn a “King of the Hill” competition was suggested and there was lots of flat out cycling to Puckane (no prizes as to who won… it starts with “D” and ends with “N”). A steady warm down back to Nenagh saw a distance of 54 miles at 16mph taking about 3.4 hours. Bike Racing: Shane Scully, Gary Scully, Eoin Woolley and Keith Butler were the only lads in bike racing action this weekend. All 4 took part in the tough Kanturk 3 Day. Unfortunately, Keith thought the race was called the Kanturk 1 Day and bailed out after just one day. Although in fairness to Keith, that was one better than Kenneth Kennedy’s Kanturk 0 Day. Well done to both lads for their efforts – it’s the thought that counts!! The race itself involved 4 stages over 3 days. Shane (read Shane’s race report) and Gary were very active in most stages of the A2/A3 race but in the end their efforts came up short. Gary finished in 33rd and Shane was 37th. 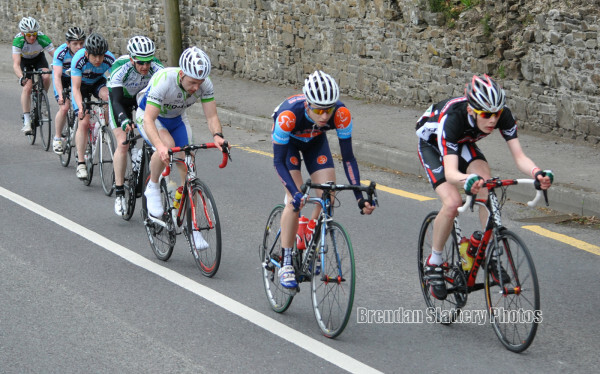 Eoin Woolley finished in the bunch on each day of the A4 race and ended up in 36th position in the final GC. Keith finished safely in the bunch in stage 1. Sunday: Karl McCarthy / Jim O’Leary Memorial – Whitechurch, Co. Cork.